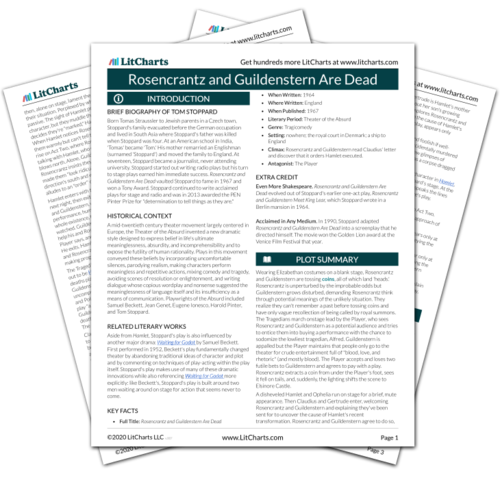 Instant downloads of all 942 LitChart PDFs (including Rosencrantz and Guildenstern Are Dead). Note: all page numbers and citation info for the quotes below refer to the Grove Press edition of Rosencrantz and Guildenstern Are Dead published in 1967. Unlock explanations and citation info for this and every other Rosencrantz and Guildenstern Are Dead quote. We have no control. Tonight we play to the court. Or the night after. Or to the tavern. Or not. There were always questions. To exchange one set for another is no great matter. Wheels have been set in motion, and they have their own pace, to which we are…condemned. Each move is dictated by the previous one—that is the meaning of order. If we start being arbitrary it'll just be a shambles: at least, let us hope so. Because if we happened, just happened to discover, or even suspect, that our spontaneity was part of their order, we'd know that we were lost. We cross our bridges when we come to them and burn them behind us, with nothing to show for our progress except a memory of the smell of smoke, and a presumption that once our eyes watered. Everything has to be taken on trust; truth is only that which is taken to be true. It's the currency of living. There may be nothing behind it, but it doesn't make any difference so long as it is honoured. One acts on assumptions. Hamlet is not himself, outside or in. Whatever became of the moment when one first knew about death? There must have been one, a moment, in childhood when it first occurred to you that you don't go on for ever. It must have been shattering—stamped into one's memory. And yet I can't remember it. It never occurred to me at all. What does one make of that? We must be born with an intuition of mortality. Before we know the words for it, before we know that there are words, out we come, bloodied and squalling with the knowledge that for all the compasses in the world, there's only one direction, and time is its only measure. Do you call that an ending?—with practically everyone on his feet? My goodness no—over your dead body. Well, if it isn't—! No, wait a minute, don't tell me—it's a long time since—where was it? Ah, this is taking me back to—when was it? I know you, don't I? I never forget a face—…not that I know yours, that is. For a moment I thought—no, I don't know you, do I? Yes, I'm afraid you're quite wrong. You must have mistaken me for someone else. It's what the actors do best. They have to exploit whatever talent is given to them, and their talent is dying. I extract significance from melodrama, a significance which it does not in fact contain; but occasionally, from out of this matter, there escapes a thin beam of light that, seen at the right angle, can crack the shell of mortality. On the contrary, it's the only kind they do believe. They're conditioned to it. I had an actor once who was condemned to hang for stealing a sheep…so I got permission to have him hanged in the middle of a play…and you wouldn't believe it, he just wasn't convincing! It was impossible to suspend one's disbelief—and what with the audience jeering and throwing peanuts, the whole thing was a disaster! Free to move, speak, extemporize, and yet. We have not been cut loose. Our truancy is defined by one fixed star, and our drift represents merely a slight change of angle to it: we may seize the moment, toss it around while the moments pass…but we are brought round full circle to face again the single immutable fact—that we, Rosencrantz and Guildenstern, bearing a letter from one king to another, are taking Hamlet to England. He couldn't even be sure of mixing us up. Now we've lost the tension. No, no, no…Death is…not. Death isn't. You take my meaning. Death is the ultimate negative. Not being. You can't not-be on a boat. Let us keep things in proportion. Assume, if you like, that they're going to kill him. Well, he is a man, he is mortal, death comes to us all, etcetera, and consequently he would have died anyway, sooner or later. Or to look at it from the social point of view—he's just one man among many, the loss would be well within reason and convenience. And then again, what is so terrible about death? As Socrates so philosophically put it, since we don't know what death is, it is illogical to fear it. It might be…very nice…Or to look at it another way—we are little men, we don't know the ins and outs of the matter, there are wheels within wheels, etcetera—it would be presumptuous of us to interfere with the designs of fate or even of kings. All in all, I think we'd be well advised to leave well alone. Life is a gamble, at terrible odds—if it was a bet you wouldn't take it. We've travelled too far, and our momentum has taken over; we move idly towards eternity, without possibility of reprieve or hope of explanation. Rosencrantz and Guildenstern are dead. Ross, Margaret. "Rosencrantz and Guildenstern Are Dead Quotes." LitCharts. LitCharts LLC, 18 Dec 2013. Web. 22 Apr 2019. Ross, Margaret. "Rosencrantz and Guildenstern Are Dead Quotes." LitCharts LLC, December 18, 2013. Retrieved April 22, 2019. https://www.litcharts.com/lit/rosencrantz-and-guildenstern-are-dead/quotes.